Whenever we go to Vancouver we have to do certain things. One is Science World - this is always a hit the boys, and S and I, love it. We also like to go to Nat's Pizza because they sell delicious fresh pizza by the slice and they carry lots of choices for us veggies. I love to go to the Bodhi Choi Heung Buddhist restaurant for dinner because for a very reasonable price you can get a decent, healthy, and delicious vegetarian dinner. S likes to stop at MEC and Lee Valley and I love to hit the thrift stores. 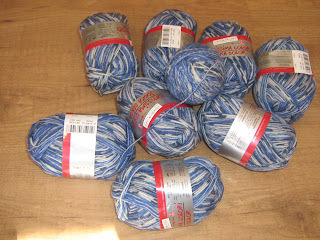 This time I found a great yarn bargain. Nine balls worth of sock yarn in exactly the color I wanted for the boys, all for a bargain price of $5.99 - not each, %5.99 for all 9 balls. That will make a whole lotta socks. 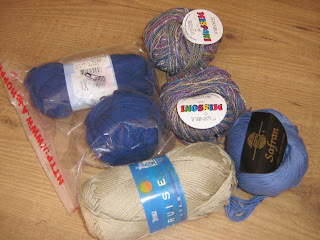 There was quite a bit of yarn at this store - the Sally Ann on North Road, in case anyone is from that area. It was hard to pick which to bring home, but I settled on the sock yarn and these. I wonder if Vancouverites realize just how rainy it is there. That may seem like a silly question but I lived there for 19 years - half my life- and if you had asked me I would have thought that yes, it is rainy but nothing too out of the ordinary. Now that I have spent some years in other places I find it difficult to imagine that I was ever able to tolerate the rain for so long. Cuz really, there is rain....and then there is Lower Mainland rain. You know? Yes, it is an awkward parking lot - and we were driving a super-cab, extended box, big barn of a work truck. ;-) If you do go there, the yarn is in a separate room in the back. They also had some big cones of yarn but I couldn't tell what the fibres were. The other things in the store seem kind of high priced - I wonder if SA is going the way of Value Village, getting fairly high-priced for second hand stuff.